The Thursday, March 27th episode of CHICAGOLAND explores the challenges facing the city’s youth and neighborhoods as community leaders come together to inspire and encourage young people to make choices that will enrich their futures. CNN and The Urban Institute have partnered for a dynamic social media discussion on the challenges in education, jobs, and public safety faced by many communities around the country. Susan Popkin (@SJpopkin), senior fellow of The Urban Institute who studies neighborhoods and youth development, and Jocelyn Fontaine (@jocefontain), senior research associate of The Urban Institute who studies community-based crime reduction programs, will lead the online dialogue on these vital issues on Friday, March 28, at 1:00p.m. ET. The discussion will explore social policy ideas for improving education and public safety on the local level. “CHICAGOLAND shows us that many social issues require a simultaneous multidisciplinary approach addressing – housing, schools, crime, neighborhoods, others in order to adequately solve challenges,” says Popkin. Viewers can join the Tweetchat by simply logging in to Twitter, then searching for #Chicagoland and offering questions or comments. 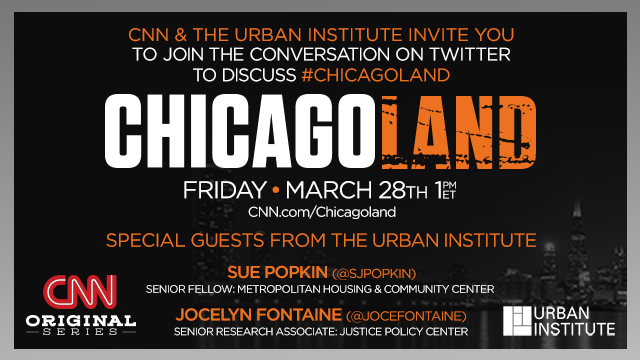 Twitter users are invited to also follow @CNNorigSeries and @UrbanInstitute and visit http://www.CNN.com/Chicagoland. The Tweetchat dialogue will also be featured on CNN.com. CHICAGOLAND airs Thursdays at 10:00pm ET and PT on CNN/U.S. For more information on the series, please visit www.cnn.com/chicagoland, and connect with the series creators via social media by using #Chicagoland.